This marine elasticated bungee cord can be used for literally hundred's of uses. This shock cord has a two component construction with an extremely tough woven braided polypropylene outer sheath covering a very strong rubber core. The cord is light-weight, strong, wear-resistant and long lasting. The cord is capable of 100% elongation. 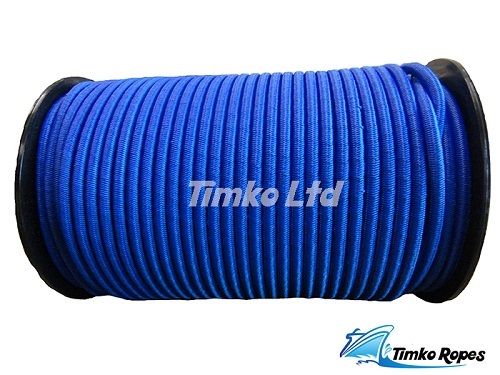 Timko Ropes Shock Cord / Bungee Rope is built to withstand the toughest environments. Years of development have produced a quality engineered durable Shock Cord / Bungee Rope that will consistently allow better than 100% elongation and recovery making it ideal for marine and industrial applications. 4) Not affected by water. 6mm - Ideal for light-weight luggage straps, Roof Racks, Trailers, Kayaks, Canoe's, Small Boats, Surf Boards, Tent Poles. Tie downs for light weight groundsheets/Tarpaulins. Widely used on garden/outdoor furniture. Many car, boat, camping, caravanning uses. 8mm - Typically used in securing standard groundsheets and tarpaulins. Also used on caravans, boats, trailers, motorbikes etc. Lots of other uses for indoors & outdoors. 10mm - Particulary suitable for heavy duty tarpaulins/groundsheets. Many other uses including tie-downs for trailers, pick-ups, roof-racks and curtain sides. It is also used for trampolines and garden furniture where the higher tensile strength is preferred.